Alana Bloom used to be a gentle, loving person who believed the best in people and who kissed Will against her better judgment. Now, her edges are sharper, and her better judgment has been replaced by doing whatever it takes to survive, no apologies given. As a consequence, her style has evolved, and she’s transitioned from wearing soft wrap dresses and boots, to donning blazers with sharp lines and bold colors. 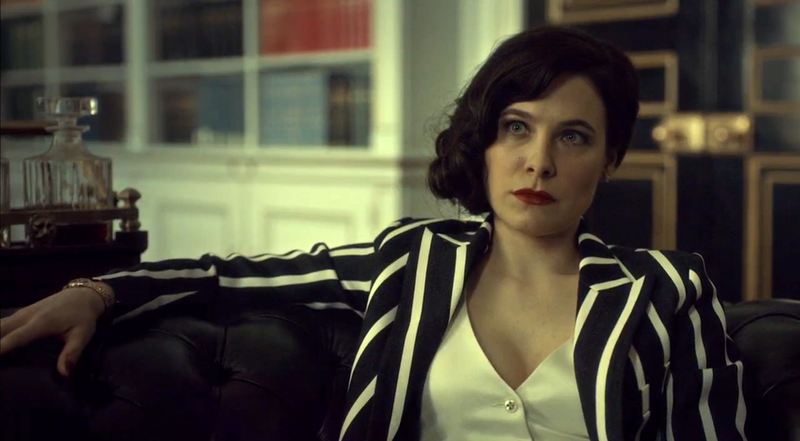 The more power Alana has over Hannibal, the more she dresses like he used to. She wears killer suits (I’ve heard she even took the suits from Hannibal’s closet when he was apprehended and had them tailored to fit her). Alana now wears and wields those suits at work with power -- one of the only people with the keys to every door between Hannibal and the outside world. Her actions are bolder this season, too, and so is her lipstick. She is the one setting up chess pieces in her and Hannibal’s game, and Alana's wardrobe clearly conveys the fact that she is not a woman to be messed with. The white, black, and red she’s been wearing are reminiscent of good, evil, and the blood that Hannibal has spilled. No, Alana isn’t messing around anymore. And neither is her wardrobe. One of my favorite Alana outfits this season is the bright coat she wore to see Mason Verger for the first time. Her coat was like a protective covering while she entered a lair of evil. Also, it was gorgeous. 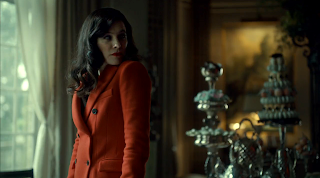 I also love the all-red suit she wears when she congratulates Hannibal on being found insane. The red in her coat, suit, and lips clearly depicts her as being braver and fiercer than she’s ever been. Throughout the rest of the "In Style" series, I'll be highlighting some characters' unique and interesting style and then helping you find pieces and plan outfits inspired by them. You can think of me as your television fashion fairy godmother. The style: Separates, patterned blazers, flowy blouses, and bold deep colors like red and blue are style tricks and tips from Alana Bloom's book. I would recommend dressing like Alana when you need to feel powerful, want to boss around the boys, or have a big presentation coming up. And this final tip is an important one: don't forget your lipstick.